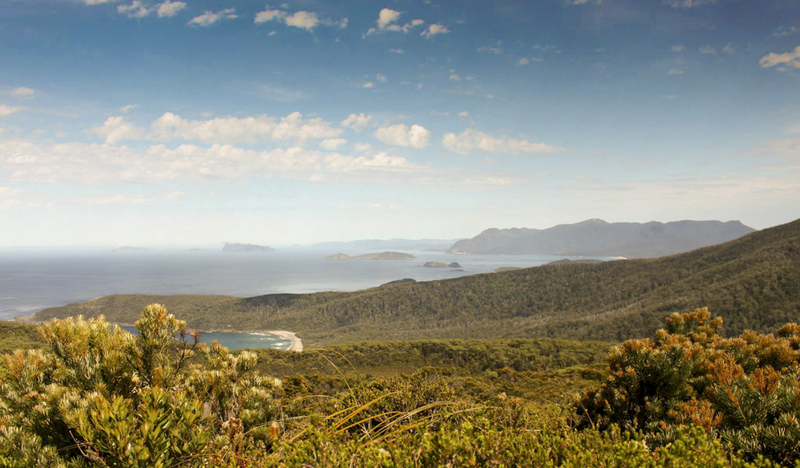 The South Coast Track located in the Southwest National Park is renowned as being one of Tasmania’s premier wilderness walks. 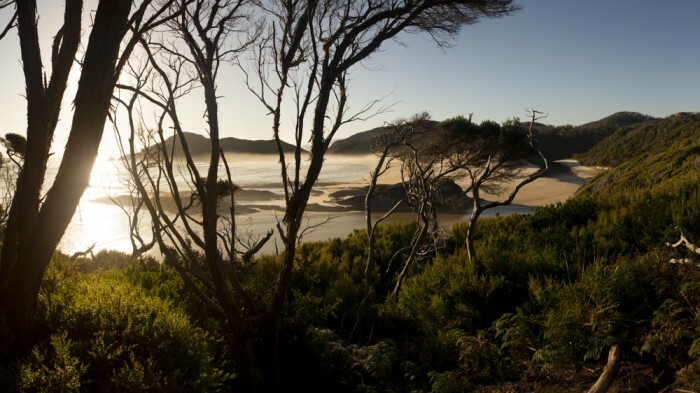 Starting deep within the World Heritage Area at Melaleuca the track takes you 85km across rugged mountain ranges, coastal heathland and vast pristine beaches. There are no roads to Melaleuca so hikers must fly in to begin the walk. Taking between 6 – 8 days to complete the South Coast Track covers some of the most untouched and remarkable wilderness found anywhere in Australia. Tackling the trail requires suitable planning, experience and equipment. 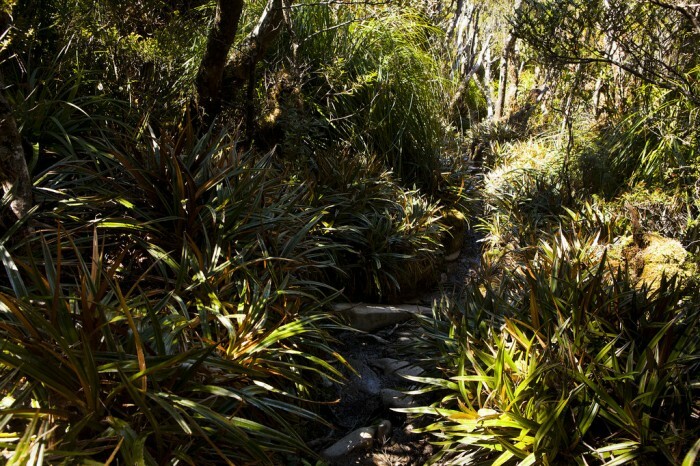 Hikers must be familiar with Tasmania’s wilderness walking conditions. It is recommended that the track is walked during the summer months. A more detailed and in-depth guide can be found at our dedicated South Coast Track site or on the Parks and Wildlife Official site. View Google Map Directions Due to Melaleuca’s remote location, the beginning of the South Coast Track can only be accessed by plane. Par Avion offer light plane flights from just outside of Hobart at Cambridge. For drop off of hikers at Cambridge: From Hobart head east over the Tasman Bridge following the Tasman Highway (A3). After 13km take the exit onto Kennedy Drive. Par-Avion is located at 115 Kennedy Drive. 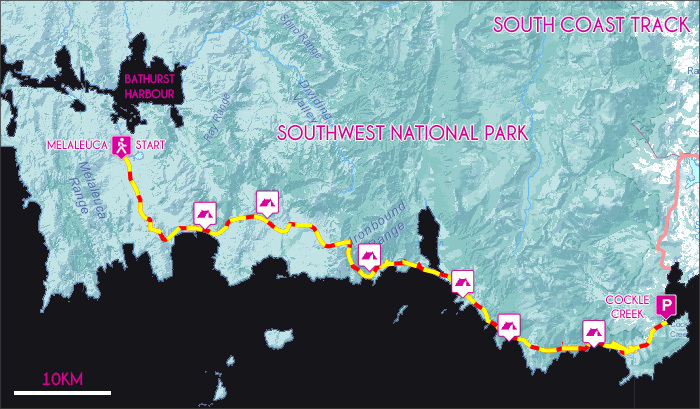 For pickup of hikers from Cockle Creek: From Hobart head south along the Southern Outlet (A6) for 10km. Take the right-hand lane at the Kingston Bypass and continue on for 2km before taking the 4th exit to Channel Highway (B68) at the roundabout. Continue through Huonville on the Huon Highway for 70km to Hastings Caves Road (C635). Following this road (changing to Lune River Road soon after) for an additional 22km to get to Cockle Creek. The South Cape Bay walk begins behind the rangers station. The following track notes are brief and should be used as an introductory guide to the South Coast Track and not an official track notes. Having walked this personally using John Chapman’s guide, the same suggested itinerary is presented here. It is recommended that walkers use the South Coast Track guidebook by John & Monica Chapman. Although the majority of the track is well constructed and easily navigated there are some sections of difficulty (especially in relation to traversing mud). The South Coast Track is a wilderness experience and all walkers must be fully self-sufficient and have suitable experience in the Tasmanian bush. There are no hut facilities between Melaleuca and Cockle Creek. Time requirements for the South Coast Track differ greatly depending on fitness levels and time spent relaxing. This guide details a recommended 7-day itinerary for people of reasonable fitness. The Southwest National Park is a fuel stove only area. Cooking fuels are not allowed on the flight to Melaleuca and must be purchased from Par Avion once at Melaleuca. Be sure to arrange this before taking off. Water is easily found on each day’s hike but be sure to always carry enough in case of an emergency. 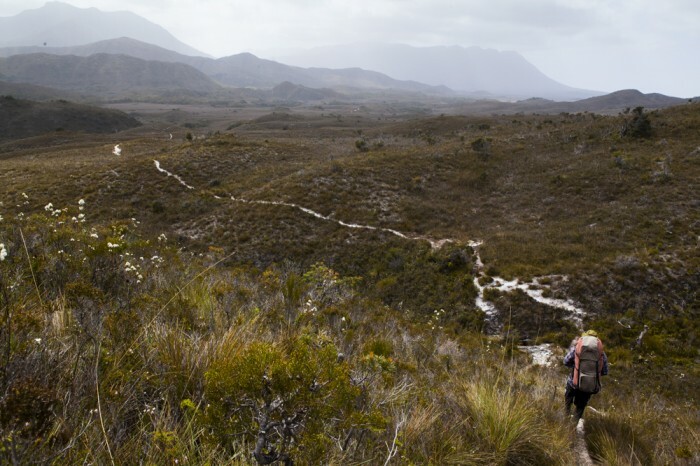 The journey onto the South Coast Track begins with a stunning bird’s eye view of the rugged Southwest wilderness from the window of your 45 minute light plane trip to Meleleuca. From this introduction, you quickly get a sense of the areas remote nature. Once down on the ground, the first night’s stop will be at Point Eric beyond Cox Bight 13km away. Trail conditions throughout the first day are the best of the entire track and walking is easy aside from a few wet patches. For the first three hours, the trail weaves across the undulating hills beside the New Harbour Range. As you approach Cox Bight the first sign of water comes from Freney Lagoon, a large lagoon set back behind the Cox Bight Beach. Once on the coast, the trail continues for another 2km to the sheltered cove of Point Eric where the first camp can be made. After an easy day’s walking, this is an idyllic spot set right on the edge of the pristine beach. With substantially more distance to cover on the second day, an early start is recommended to avoid sustained walking the afternoon heat. Leaving Point Eric the track continues along the beach and skirts below Black Cliffs. After another short beach walk Buoy Creek and the adjacent campground are passed and the trail heads inland towards Red Point Hills. For the next 4km the trail crosses muddy button grass plains before eventually climbing and descending over Red Point Hills. In the distance, the ever-present form of the Ironbound Ranges is clearly visible. At the bottom of the hills, the track crosses Faraway Creek and provides a suitable spot to replenish your water supply. The track then continues below Spica Hills, crossing Louisa Plains via another muddy boardwalk section. The trail then enters lovely forest canopy surrounding Louisa Creek. A small campsite can be found here. After another kilometre, Louisa River and the second nights camp nestled amongst the temperate rainforest canopy is reached. 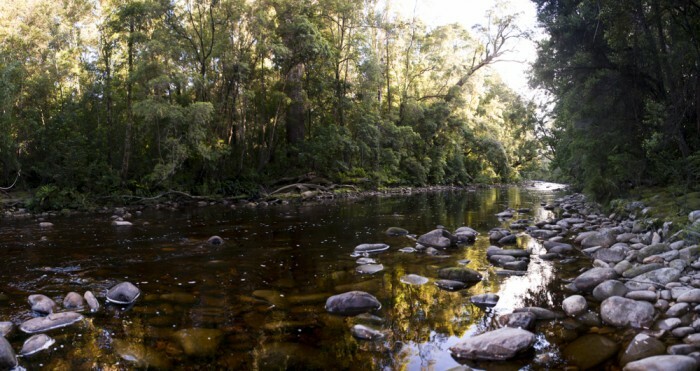 In good weather, the river is easy to cross with the assistance of a guide rope. Totaling 17km the second day is the longest of the track but is not the hardest. That comes tomorrow with the crossing of the Ironbound Range. 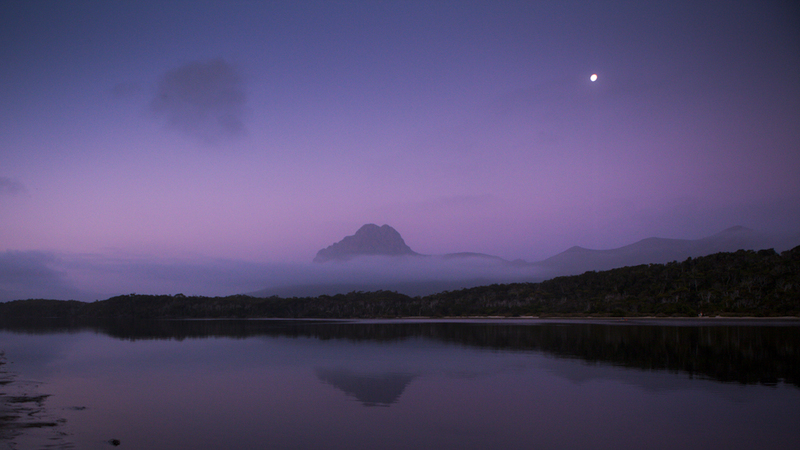 A side trip to Louisa Bay can also be undertaken, shortly before Louisa River and provides a lovely coastal campground. Please note this adds 6km to the total trip distance. The third day consists of the most challenging climb of the South Coast Track, the Ironbound Range 905 metres above sea level. The climb isn’t particularly hard thanks to the well-constructed steps. However, it can be extremely tiring and wild weather including snow and high winds may hinder your journey nearing the summit. Leaving the picturesque Louisa River, the Ironbound is the first challenge of the day as we make our way to Little Deadmans Bay. Taking it slow and steady, the first few hours of the walk are spent passing the foothills and scaling the impressive rock ledges of the mountain range. As you continue many fake apexes deceive your sense of scale until you eventually make it to the summit after an exhausting effort. Once at the top, the views are breathtaking with panoramic views of the Southwest National Park including Arthurs Range and Federation Peak to take in. To the east, the rest of the South Coast Track is laid out with the South Coast Range yet to be crossed in the distance. Ironbound High Camp is located just beyond the summit point. From here it is another 7km to Little Deadmans Bay. On the descent your surroundings change dramatically, entering some of the thickest rainforest walking conditions in Tasmania. Careful stepping is required to navigate the labyrinth of muddy buttress roots underfoot. After another hour of walking the trail finally arrives at Ironbound Low Camp, just above the coast. For the next 4km going is much easier and flatter, eventually arriving at lovely Little Deadmans Bay camping area. Campfires are allowed here. In comparison with the previous day today’s 9km trek to Prion beach is much easier, although some challenges are faced thanks to the constant South Coast mud. Today also includes a boat crossing at New River Lagoon. Leaving Little Deadmans Bay the track returns to the plains and to the mud, the thickest yet. Deadmans Bay is reached next and the track continues along the beach for a short distance before heading inland across Menzies Bluff. After battling the mud once again for an hour the trail opens up onto spectacular Prion Beach. From here on walking is much easier with only 5km stroll along the beach required before coming to the New River Lagoon boat crossing. At each side of the Lagoon, there is a boat tied to allow passage from either side. 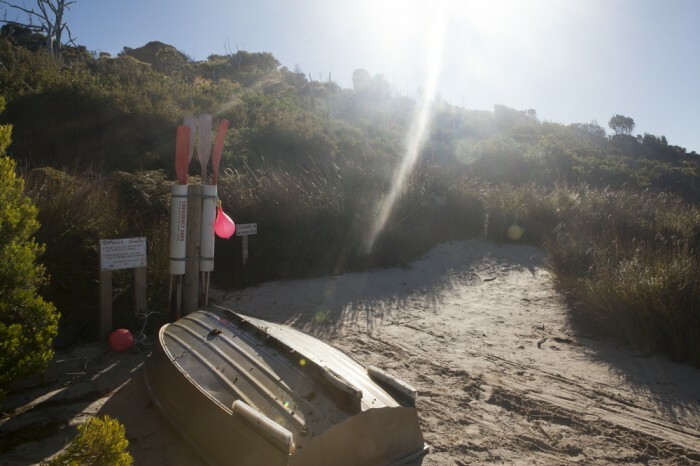 In order to ensure this access, walkers must leave the boats where they were found. This requires multiple trips. First row one boat across to the other side. Row the boat back to the other side and tie to the mooring post. Once safely on the other side, the Prion Beach campsite is found nestled just beyond the tree line. From Prion Beach the track heads inland across the first of the South Cape Range headlands, passing through Eucalypt forests to Surprise Bay and eventually on to Granite Beach where camp will be made. After some short climbs, the track from Prion Beach reaches the top of the headland. From here amazing views stretch along the coastline in both directions. Continuing on, the track crosses Milford Creek via a newly constructed bridge. 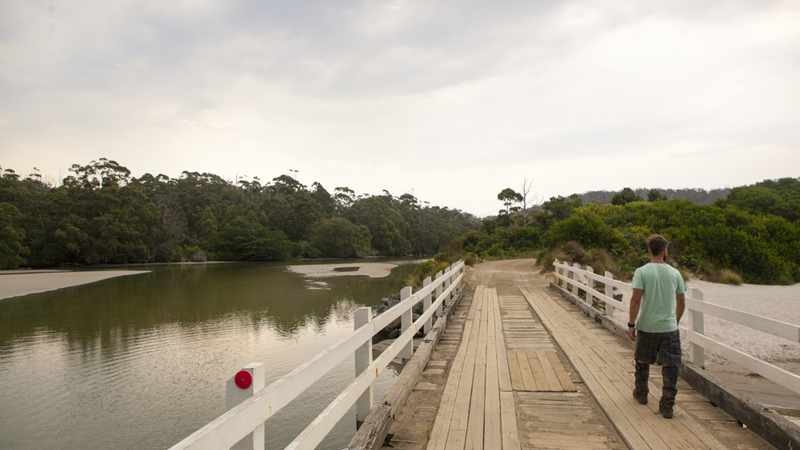 The track undulates through the forest and boardwalk above muddy plains before finally descending to Surprise Bay. Surprise Bay is awe inspiring with huge rocky outcrops greeting you as you arrive at the beach. After a short stroll across the beach, the track passes Surprise Rivulet and climbs up the coastal cliff to the elevated Surprise Bay camping area. From here the trail heads inland again through scrub to Granite Beach 3km away at end of Shoemaker Bay. Granite Beach is a mix of sand and large stones and careful footing is necessary as you make your way up the far end of the beach towards the campsite. At the end of the beach just below the camp, a fantastic waterfall running off the cliff’s edge is climbed to finish the day’s hike. Leaving the spectacular Granite Beach camp area the track returns to the muddy marshes and slowly climbs to Flat Rock Plains on the South Cape Range. Walking here is difficult due to the ever-present mud and care should always be taken. After a few hours of walking the South Cape Range, the summit is reached. From here the view back towards the Ironbound Range is rewarding, highlighting the area successfully passed in the previous days. As you descend again walking is slow due to the thick overgrown forest and deep muddy sections. Eventually, after another small climb and descent, South Cape Rivulet appears through the tree line. Once the shallow rivulet has been waded, camp can be made in under the tree cover further up the rivulet. 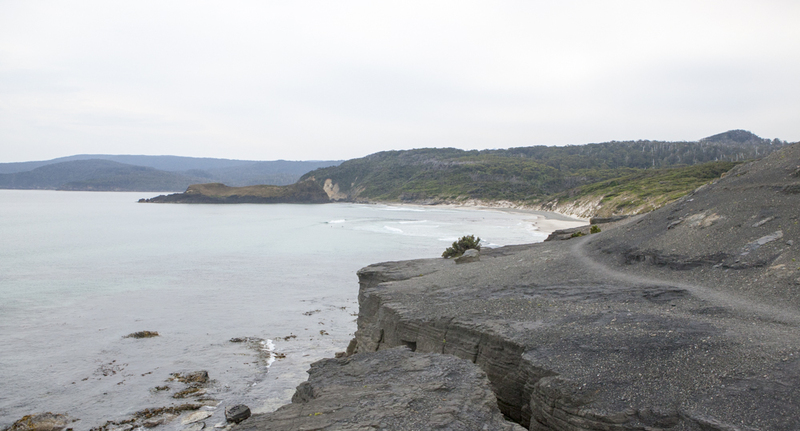 From just before the end of the beach at South Cape Rivulet the track heads inland and climbs to the cliff top headland of Coal Bluffs before slowly descending through thick muddy forest to South Cape Bay. As you approach South Cape Bay, Lion Rock is the first landmark to be spotted through the trees, its impressive figure signposts the beginning of South Cape Beach. Once safely down on the beach the track continues up the cliff on the opposite end. After conquering the steep staircase the knowledge that there will be no more climbs are necessary can be celebrated. From here it’s a simple 3-hour stroll through Eucalypt forest and across duck boarded marshlands to Cockle Creek and the end of the South Coast Track.